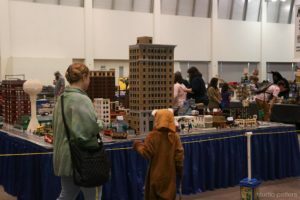 West Michigan LEGO Train Club (WMLTC) will display a large town/train layout with three trains running at the Grand Rapids Comic-Con in the Kids Area in exhibit hall A. WMLTC will also bring LEGO bricks and other products for kids to play and build projects on their own as well as some LEGOs for sale. Make sure to bring your little ones to the LEGOs area and check out all the fun. WMLTC is a chapter club of MichLUG, focusing on events and meetings in Western Michigan. We are an organization for adult and mature teen hobbyists rather than kids and pre-teens. We are available to setup displays for train shows, museums, comic-cons, etc. Contact us here with your requirements and we will work something out. Our website is www.wmltc.org.